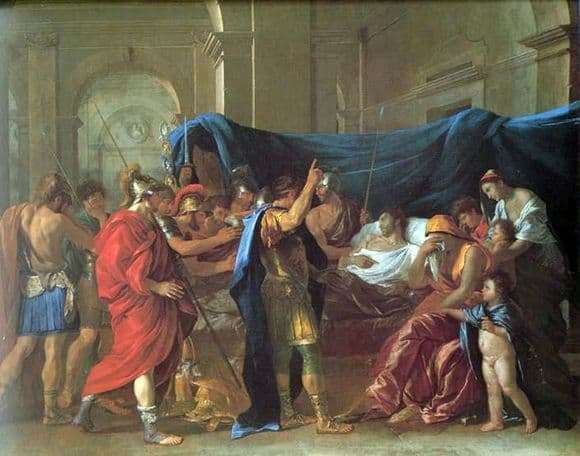 Nicolas Poussin with his work shows us the last minutes of Germanicus – the Roman commander and future emperor. As the son of Tiberius, he had a high influence, as well as all the possibilities, to soon change his father. However, unexpectedly for all of his disease mows down. On the main background, we see a weary, pale man who is in the last minutes of his life. However, knowing his imminent demise, his gaze does not express the indifference that is inherent in his position. Not. As if he was tired and irritated, he was taking his head away from the annoyed crowd that surrounded him. One can only guess what they are saying to him. But one thing is clear – he doesn’t care. Judging by the exposed index finger, Germanic seems to be showing something to his mourners. Maybe this is a request for his loved ones who are sitting to his right. And maybe the requirement to leave the premises. The second option would not be surprising, looking at the expression of those present. And those present, in turn, have different intentions. Some people seem to be smiling and Germanic says something fun. Which reflects either the joy of his death, or the encouragement of his comrades. One of the guests has their backs turned to us, but according to his gesture – the index finger pointed up, it is clear that he is making a statement. This may be a promise to punish the guilty, and there may be a demand. Only after noticing that a wreath is placed on his head, it becomes clear that the Roman emperor is standing in front of the bed. Only some of the warriors cover their faces with their hands. Surely this is the faithful servants of his master. They drifted into the background and, silently, escorted their master. One of the devoted warriors holds Germanika by the shoulder. It can be seen as he angrily looks toward the noisy crowd, but no one pays attention to him.